Star Alliance cheap flights from Paris to Boston from just €206 return! Another amazing deal with a Star Alliance airlines today this time super cheap return flights from Paris to Boston already for €208! Fare is for a round trip including all taxes however no checked in luggage. (Available for extra cost). The cheapest solution to US East coast requires long layover on your way so consider this before you book this deal. (We suppose to book slightly more expensive flights with short layover on your way…see our note below). You are low budget traveler looking for the cheapest flights from France to Boston do not miss this newest promotion with Lufthansa, Air Canada or United. Conditions of this Star Alliance promotion is similar to the previous ones from the UK or Amsterdam. Look for flights departing from France to Boston from 23rd of September 2018 to end of March 2019. Blackout period around Christmas Holidays. Max stay 3 months. Promotion with Lufthansa or Air Canada is running till end of September. (But we suggest that the cheapest flights will be sold out very soon..). Below you will find our booking sample as well as links to our previous deals to New York..
Travel dates. You can easily compare either with Air Canada or Lufthansa then book it with your preferred booking agent or directly with airline. Need cheap accommodation in Boston you can use Booking.com. or consider currently released discount codes by Hotels.com or Otel. Booking sample of Star Alliance cheap flights from Paris to Boston from just €208 return! As per our booking above travel date of your outbound flight from France to USA would be on 15th of November. Inbound flight from North America back to Europe on 28th of November 2018. 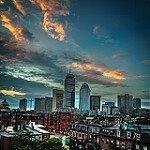 Looking for budget solution do not miss this discount offer and book the cheapest flights to Boston!